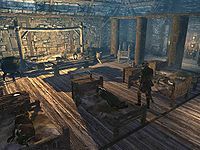 The Argonian Assemblage is the building on the docks of Windhelm in which all the Argonian dockworkers are forced to live. It is located west of the stairs leading from the docks up to the city of Windhelm and to the east is the office of clan Shatter-Shield. A Few Words with You: Do a favor by talking to someone about a problem. Some Light Theft: Do a favor by stealing an item. 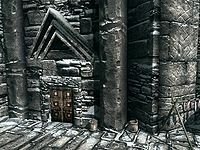 Outside of the assemblage is Windhelm's docks where, during the day, the occupants of the assemblage work; no matter the weather conditions. To the northeast of the door is a wooden rack holding seven salmon that can freely harvested. On the docks there is a grindstone, tanning rack, and a workbench available for you to use. Both inside and out, the Argonian Assemblage is dark and in disrepair; a perfect place for the prejudiced and proud Nords of Windhelm to keep their unwanted Argonian workers. The dockworkers retire at the end of the work day to their shared living quarters. Inside, there is not much to look at. Cobwebs hang from the ceiling, and a dull fire burns under empty cooking pots. There are four beds, one for each resident of the assemblage. There are several round wooden pillars supporting the high ceiling around the room. On your left as soon as you enter is a round wooden table. Against the west wall is a cupboard holding a gourd and bottle of wine. A dresser to the right holds a copy of the Pickpocket skill book Thief, and a lute on top. There is a second dresser further to the right with two bottles of alto wine on top and a drum and chair beside it. Against the north wall is a tall wardrobe. Both this and the dressers all contain various items of clothes and fine clothes. There are several crates further along the wall. Next to these is an alcove containing a square table and two chairs with a bottle of wine, a loaf of bread, and a couple of wedges of cheese on top and an apple pie on the floor underneath. More crates are to the right of the table with a knapsack on top of one of them, containing leveled items. Along the east wall is a long fire pit with several unusable pots hanging over it, a bottle of wine on the floor to the left, a cast iron pot containing three potatoes on the right-hand edge of the surround, and two pieces of firewood to the right of the pit. In front of it is a long wooden table and bench with a bottle of wine, a baked potato, a salt pile, a loaf of bread, a pheasant breast, and a salmon steak all on top. There are also several unusable barrels in the southeastern corner. There are four beds in a row to the left of the middle of the room; each bed has an end table either at the head or foot of it. The third has a bottle of Nord mead on top and the fourth has a pickaxe and bowl of troll fat on top. This is a good place to train Lockpicking because the master-level lock on the door resets often. Because of this, it seems Scouts-Many-Marshes and Stands-In-Shallows become trapped inside after turning in for the night, and cannot come out the next day unless the door is unlocked by you. Even if you are an Argonian, you will still receive a bounty for trespassing unless you are married to one of the residents. There is an Empty shadowmark to the bottom left of the entrance door. Three of the four reptilian residents offer quests. All cupboards and end tables on the room are non-respawning.